Old Newspaper Clipping Spurs Cold Case Investigation It was a saved newspaper article that led to the FBI investigation into John Queen's death four decades later. There's the mystery of how John Queen died, and then there's the question of how Queen's death ended up on the FBI's list of Civil Rights Cold Cases. The answer is that it was a kind of accident — or a stroke of luck. Days after Queen died in Fayette, Miss., in August 1965, a woman hundreds of miles away saw a small newspaper article that mentioned Queen's death. She took her scissors, cut out the article, and filed it away. It was that saved newspaper article which led to an FBI investigation — and NPR's investigation — four decades later. The woman who clipped the story was Marge Manderson of the Southern Regional Council (SRC), a civil rights group based in Atlanta. She was a program officer, but also a proofreader who obsessively reviewed every SRC publication. She subscribed to small, local newspapers all over the South. And, with her scissors nearby, she would read through stacks of newspapers, looking for stories about white-on-black violence. Manderson's manila folders with newspaper clippings were later known to researchers as "The Lynching Files." Often, they were the only saved record of lynchings and other race-related incidents in the South. 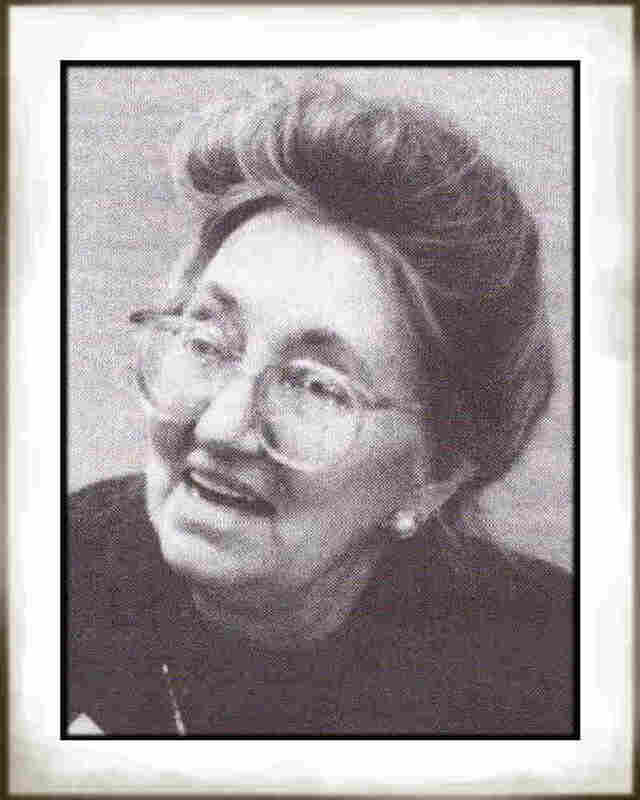 A photo of Marge Manderson, from the Southern Regional Council's newsletter. Her files of newspaper clippings included John Queen's story. Manderson saw one or more of the few short articles that were written when Queen died, likely from either the Fayette or Natchez newspapers. These stories, relying upon the telling of Jefferson County Deputy Sheriff Robert Pritchard, recounted that Jasper Burchfield, an off-duty constable from nearby Adams County, shot Queen in self-defense. Steve Suitts, a former SRC director, remembers Manderson for her tenacity and strong beliefs. "Marge Manderson was a junk-yard dog," he says. "She combed those newspapers. She said, 'I could ignore the front page and the editorial page.' " Suitts says she usually found stories about racial violence in the back pages of the newspapers. Manderson went to work for the SRC, a coalition of Southern lawyers, ministers and newspaper editors seeking to promote racial equality, in 1954. That was shortly after the U.S. Supreme Court's ruling in Brown v. Board of Education. Manderson joined the civil rights group, according to her obituary in The New York Times, because "she believed it important that whites work for school desegregation." Manderson was 64 when she died of bone cancer in 1992. Her lone survivor was her mother. Before Manderson died, she also became an animal-rights advocate. She took to protesting outside the headquarters of the local utility because it had brought hawks into the city to get rid of pigeons. "She'd go down on her lunch hour," Suitts remembers. "And she'd be a one-person picket line against Georgia Power." But Manderson's role in the reopening of over 100 cases of civil rights era has largely been lost to history. The FBI's Civil Rights Cold Case Initiative started in 2006 when FBI officials asked state and local law enforcement officials, civil rights groups and others for names in unsolved murders. Eventually, the FBI would open 112 cases for investigation. Most of the names, including Queen's, were on a list provided to the FBI by the Southern Poverty Law Center. The Montgomery, Ala., based civil rights group had listed Queen in a display at its headquarters of 74 men and women called "The Forgotten". These were obscure cases of people who died in what seemed to be racial violence during the 1950s and 1960s. The names of an additional 40, better-known "Civil Rights Martyrs" are etched into the center's black granite "Civil Rights Memorial," designed by artist Maya Lin. The Southern Poverty Law Center's "The Forgotten" had its origins with Manderson. Those names are from two lists of the cases she collected and published in New South, the SRC's magazine. In all, she named 85 deaths in the lists called, "Some Race Related Deaths in the United States (1955-1965)." The entry on Queen was typical. It was short and basic: "White off-duty constable named in the pistol slaying, which was not connected with any arrest." And that's the information that the Southern Poverty Law Center — without knowing about Manderson's role — passed along to the FBI. The FBI reviewed the cases that were suggested by civil rights groups and others. When the FBI looked at its own records, it did not find any files on Queen. But it did find files on Burchfield, the man who shot him. Burchfield had been identified by an informant for the state police as a member of the violent White Knights of the Ku Klux Klan. Also among the nearly 300 pages of FBI files NPR obtained from a Freedom of Information Act request, were two newspaper stories about Queen's death. At least one of those stories was clipped and saved nearly 50 years ago by Manderson.